This painting makes me catch my breath, for it captures so beautifully the thoughts of a mother. The Monster House has been having a rough time.. a crisis, actually, which accounts for my sporadic attendance here, on twitter, and on facebook. Because of the trauma, I find myself thinking deep thoughts about my little monster in distress, the thoughts of a mother who wants so desperately to make everything better. My circle of friends and I used to make jokes about being ready for our M.D., our degree in psychology, or our degrees in speech therapy, occupational therapy, physical therapy, our teacher's certificate, etc. because we have done so much research, so much work with our teams, so much learning. If only I really DID know everything I needed to know medically, and emotionally. Instead, I am helpless.. looking on, crying hot tears, in anguish because my child is hurting~ at times even wishing it were Logan ( I know how terrible that is, believe me. I know) because then I would know what to do. Who to call. How to help. What to request. Instead I look on, watching my monster struggle, watching her fear and her confusion, her utter incapability to process the whole crisis because she's too young to understand any of it. I hold her, and rock her, and tell her she is my angel. I reassure her in every way I can, telling her all the while that I love her. I dry her tears, and rub her back while she trembles. I whisper over and over that I will never leave her, that I will always be there, will always listen, will always protect her. Only, I wasn't, I didn't. And, oh.. the guilt. The horrible, terrible, consuming guilt of a mother. Could I have prevented this? Most likely not. I knew her before she was born, this bright, vibrant creature who can light up a room with her smile. Only now there are no more smiles, there is no more silliness, no more elementary school dramas of BFFs and who wore what that was a fashion disaster, or even worse... fashion suicide. Where there was once color and life there is now only sadness and grey. My brain is screaming all the time, "HELP ME HELP MY CHILD!" .... but.. I don't know who can help me help my child. And she fades a little more each day, while I scramble in stealth mode to find help, answers... and sneaking whispered, tense conversations with the Daddy very late at night, who is out of town on business yet again. Secret meetings with school counselors and administrators while she is, mercifully, sleeping( Thank you, thank you, Mighty M, for being here!!). Help me help my child. Please. 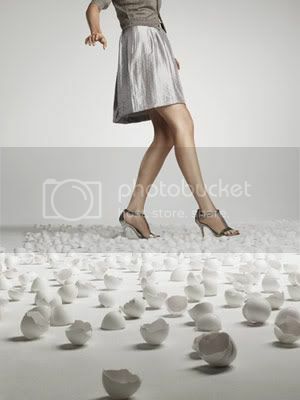 walking on eggshells image by photobucket, through google images.